Hypercalcemia rarely causes acute pancreatitis due to secretory block in the pancreas and damage by accumulated proteases. Hypercalcemia, though described in granulomatous disorders, is uncommon in tuberculosis. Acute kidney injury is known to occur with acute pancreatitis, secondary to sepsis and septic shock; however, acute pancreatitis resulting in acute cortical necrosis is very rare. We report a 22-year-old woman, who presented with pain abdomen and vomiting. She was found to have features of acute pancreatitis, both biochemically and radiologically. She had hypercalcemia on presentation and this was attributed to be the cause for pancreatitis as other causes were ruled out. 1, 25-dihydroxyvitamin D level was high with normal parathyroid hormone level. Whole-body positron emission tomography-computed tomography showed increased fluorodeoxyglucose uptake in the terminal ileum and histology from that area showed noncaseating granuloma with acid-fast bacilli in the tissue. She was treated with antituberculosis therapy; hypercalcemia improved over a period of time and pancreatitis resolved. She developed anuric renal failure, and kidney biopsy showed patchy acute cortical necrosis. She is dialysis dependent at the end of 6 months. To the best of our knowledge, this is the first case report of a patient with ileal tuberculosis presenting with hypercalcemia and acute pancreatitis. This case is reported due to the rarity of extrapulmonary tuberculosis presenting with symptomatic hypercalcemia, acute pancreatitis, and acute renal cortical necrosis. Hypercalcemia is uncommon in tuberculosis. Hypercalcemia can cause acute pancreatitis due to secretory block in the pancreas and damage by accumulated proteases. Acute kidney injury is known to occur with acute pancreatitis, secondary to sepsis and septic shock. In India, acute cortical necrosis due to acute pancreatitis is reported in 3.5%–4.6% of the cases., Tuberculosis, as a cause for severe hypercalcemia resulting in acute pancreatitis, is not reported in the literature. We report an unusual case of hypercalcemia-induced acute pancreatitis resulting in acute renal cortical necrosis (RCN). A 22-year-old woman presented to our hospital with pain abdomen and vomiting for 5 days. There was no history of fever, loose stools, dysuria, and hematuria on admission. Examination revealed distended abdomen and diffuse abdominal tenderness. She was oliguric on presentation and her serum creatinine was 2.6 mg%. She had leukocytosis (total count – 27,200 cells/cumm) with evidence of acute pancreatitis (serum lipase levels – 5250 U/L). Ultrasonogram (USG) showed enlarged pancreas with peripancreatic collections and it was confirmed on computed tomography (CT) of abdomen. There was no evidence of cholelithiasis on CT scan; however, omental inflammatory stranding with micronodular appearance was reported. She was managed conservatively with bowel rest and parenteral antibiotics. In view of oliguric renal failure, she was initiated on hemodialysis. She had normal triglyceride levels (94 mg/dl), and there was no evidence of sepsis (blood and urine cultures were sterile); however, her serum calcium level was high (12.8 mg/dl). Since no other cause was found, hypercalcemia was considered to be the cause for acute pancreatitis. USG neck was normal. Her parathyroid hormone (PTH) level was normal (18.73 IU/L), and 25-hydroxyvitamin D was 93 nmol/L, which ruled out hypervitaminosis D. However, 1, 25-dihydroxyvitamin D level was high (318 pmol/L). Calcium remained high in spite of dialysis, and she was treated with calcitonin injections. Serum angiotensin-converting enzyme level was normal (35 U/L). Whole-body positron emission tomography-CT (PET-CT) was done which showed a lesion with high fluorodeoxyglucose uptake in the terminal ileum [Figure 1]a and mesenteric lymph nodes. CT chest was normal. Colonoscopy showed mucosal nodularity with an ulcer and mild luminal narrowing in the terminal ileum. Biopsy samples were taken from the ileal ulcer and from the mesenteric lymph nodes using endoscopic ultrasound. Lymph node biopsy showed necrosis with noncaseating granuloma containing Langhans giant cells [Figure 1]b, and biopsy from the ileal mucosa showed multiple discrete and large nonconfluent granulomas composed of epithelioid histiocytes and multinucleated giant cells; some of the granulomas showed central suppuration [Figure 1]c. Acid-fast bacilli were seen in the tissue. GeneXpert test from the tissue for Mycobacterium tuberculosis complex was positive, and QuantiFERON TB gold assay was positive. After confirming tuberculosis, she was started on four-drug antituberculous therapy (ATT) at a modified dose. She was continued on hemodialysis as she was oliguric. 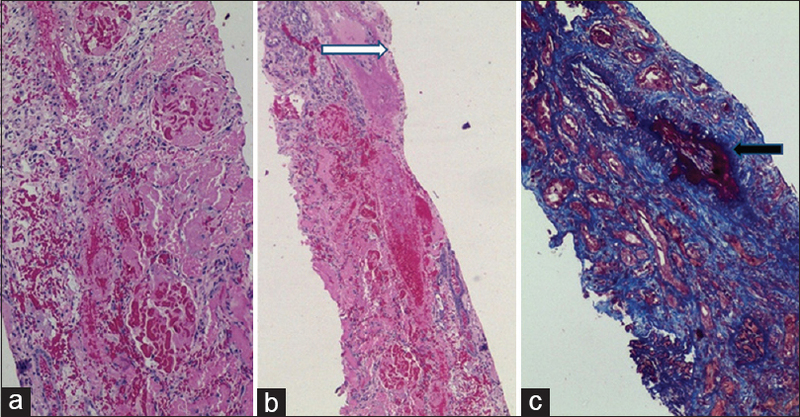 In view of nonrecovery of renal function after 2 weeks, renal biopsy was done, which showed patchy cortical necrosis with fibrinoid necrosis of the medium-sized arteries [Figure 2]a, [Figure 2]b, [Figure 2]c. Antinuclear antibody and antineutrophil cytoplasmic antibody were negative, and serum complement level was normal. Two months after starting ATT, serum calcium level reduced to 9.1 mg/dl and 1, 25-dihydroxyvitamin D levels reduced to 18.16 pmol/L. Her urine output improved and was given a trial of dialysis withdrawal; however, she developed uremic symptoms and is dialysis dependent at the end of 6 months. The patient had hypercalcemia-induced acute severe pancreatitis which led to acute RCN and severe renal failure requiring dialysis. The cause of hypercalcemia is increased secretion of 1, 25-dihydroxyvitamin D from the granulomatous tissue in the terminal ileum, which is secondary to tuberculosis. The laboratory parameters of the patient before and after ATT have been depicted in [Table 1]. Hypercalcemia affects pancreatic duct permeability and modifies pancreatic secretions. This results in protein plug formation and sometimes formation of pancreatic calculi, which can block the pancreatic duct. Hypercalcemia-induced secretory block and accumulation of digestive zymogens within the pancreatic acinar cells resulting in injury have been shown in animal models. Alcohol and gallstones are the most common causes for acute pancreatitis accounting for 60%–75% of the cases. Metabolic causes of acute pancreatitis are less common, which include hypertriglyceridemia, hypercalcemia, diabetes mellitus, and rarely Wilson's disease. Hypertriglyceridemia accounts for 2%–7% of the cases, especially when the level crosses 1000 mg/dl. Primary hyperparathyroidism (PHPT) is the most common cause for hypercalcemia-induced pancreatitis. Higher incidence (6.8%–12%) of PHPT-induced pancreatitis has been reported from India., Our patient had normal PTH levels, and ultrasound neck was normal; no cause other than hypercalcemia was found to be the causative factor for acute pancreatitis. Normally hypocalcemia is expected in acute pancreatitis, and the presence of hypercalcemia provides a strong clue to look for its etiology. Hypercalcemia has been described in patients with granulomatous disorders, commonly associated with sarcoidosis and tuberculosis, and rarely, they are symptomatic (12%). Incidence of hypercalcemia due to tuberculosis is between 2.3% and 28% depending on the population studied., Hypercalciuria is most commonly seen with this condition due to hyperabsorption of dietary calcium. Hypercalcemia in tuberculosis and sarcoidosis is due to extra-renal conversion of 25-hydroxyvitamin D3 to the active form 1, 25-dihydroxyvitamin D3 by the activated macrophages in granulomata due to increased production of 1-alpha-hydroxylase and is independent of PTH. In such cases, glucocorticoids have been successful as an adjunctive therapy to antituberculous medications. Our patient received a short course of steroids along with ATT. Only few case reports of parathyroid-independent hypercalcemia associated with renal failure have been described in patients with active pulmonary tuberculosis. Renal failure in those cases was attributed to renal vasoconstriction associated with hypercalcemia. RCN accounts for <2% of all cases of acute kidney injury in developed countries and 6%–7% in developing countries. RCN results from severe degree of renal ischemia secondary to significantly reduced renal tissue perfusion usually on account of intravascular coagulation, microvascular injury, or extreme vascular spasm. Acute RCN is a rare complication following acute pancreatitis. In a study from North India, RCN following acute pancreatitis was seen in 3.5% of the cases, and in another study, it was seen in 4.6% of the cases. In patients with acute pancreatitis, cortical necrosis usually results from decreased blood supply following septic shock or volume depletion. In normotensive patients with acute pancreatitis, release of vasoactive or cytotoxic substances can result in RCN, which is the likely pathogenesis in our patient. Our patient was hypertensive on admission requiring multiple antihypertensive medications. To the best of our knowledge, this is the first case report of a patient with ileal tuberculosis presenting with hypercalcemia and acute pancreatitis. This case is reported due to the rarity of extrapulmonary tuberculosis presenting with symptomatic hypercalcemia, leading to acute pancreatitis and the rarity of acute pancreatitis causing acute RCN. Even moderate hypercalcemia can result in acute pancreatitis and acute cortical necrosis. Jacobs TP, Bilezikian JP. Clinical review: Rare causes of hypercalcemia. J Clin Endocrinol Metab 2005;90:6316-22. Chugh KS, Jha V, Sakhuja V, Joshi K. Acute renal cortical necrosis – A study of 113 patients. Ren Fail 1994;16:37-47. Sahay M, Swarnalatha G, Swain M, Padua M. Renal cortical necrosis in tropics. Saudi J Kidney Dis Transpl 2013;24:725-30. Frick TW, Mithöfer K, Fernández-del Castillo C, Rattner DW, Warshaw AL. Hypercalcemia causes acute pancreatitis by pancreatic secretory block, intracellular zymogen accumulation, and acinar cell injury. Am J Surg 1995;169:167-72. Yoon YK, Ji JH, Mun BS. Hypertriglyceridemia-induced pancreatitis. Korean J Gastroenterol 2008;51:309-13. Koppelberg T, Bartsch D, Printz H, Hasse C, Rothmund M. Pancreatitis in primary hyperparathyroidism (pHPT) is a complication of advanced pHPT. Dtsch Med Wochenschr 1994;119:719-24. Agarwal A, George RK, Gupta SK, Mishra SK. Pancreatitis in patients with primary hyperparathyroidism. Indian J Gastroenterol 2003;22:224-5. Abbasi AA, Chemplavil JK, Farah S, Muller BF, Arnstein AR. Hypercalcemia in active pulmonary tuberculosis. Ann Intern Med 1979;90:324-8. Keleştimur F, Güven M, Ozesmi M, Paşaoğlu H. Does tuberculosis really cause hypercalcemia? J Endocrinol Invest 1996;19:678-81. Rizwan A, Islam N. Middle aged male with pulmonary tuberculosis and refractory hypercalcemia at a tertiary care centre in South East Asia: A case report. Cases J 2009;2:6316. Rajendra A, Mishra AK, Francis NR, Carey RA. Severe hypercalcemia in a patient with pulmonary tuberculosis. J Family Med Prim Care 2016;5:509-11.